We’d love your help. 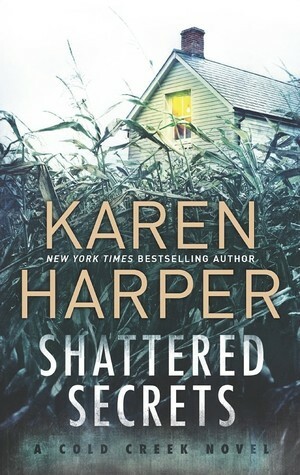 Let us know what’s wrong with this preview of Shattered Secrets by Karen Harper. To ask other readers questions about Shattered Secrets, please sign up. Ok, so during the first 1/4 of the book- I had high hopes. Things were interesting, promising a great mystery. Then things got...well ridiculous. Without giving the end of the book away, let's just say that the clues found include a vintage scare crow called "Mr Mean", a stuffed pit bull, a life size stuffed doll, and other outrageously odd things. The ending was absolutely absurd. I'm sorry...but come on. As the wife of a police officer, I tend to hate reading crime thrillers. The way the office Ok, so during the first 1/4 of the book- I had high hopes. Things were interesting, promising a great mystery. Then things got...well ridiculous. Without giving the end of the book away, let's just say that the clues found include a vintage scare crow called "Mr Mean", a stuffed pit bull, a life size stuffed doll, and other outrageously odd things. The ending was absolutely absurd. I'm sorry...but come on. As the wife of a police officer, I tend to hate reading crime thrillers. The way the officers are portrayed as well as the way they operate in these books are usually so off the wall and the opposite of reality. This one did not have too much of that, however it was very unrealistic that Gabe took Tess with him on his interviews and investigations. Especially with her being a prior victim in the very crime being investigated. There is no way that would have happened in reality. Ever. The conversations were forced and somewhat unrealistic. The dialogue was more informational than a real conversation would be. It was like each character had to relay the new facts on the case. It just didn't read well at times. Tess was not very likable. She was...well...dumb. She never listened to advice, never followed police orders. She was "better than" all that and would take dangerous situations into her own hands, even when it wasn't needed. A little of that in a novel is ok, even welcome, but after so much of it you think "come on! Stop being stupid and getting in the way!" She irritated me to no end. I did love the setting of Tess' new home being Jackson Michigan. That is my home town, and it was fun to see the name of that small town in a book- as well as the reference to The Cascade Falls. I loved the unraveling of the mystery, as it used Tess and her amnesia as the tool of the story. As she remembered what happened in the past, the story would unravel and reveal more detail. That was a fun way to tell a mystery, and I did enjoy that part. It took me a couple of chapters to get into this book but once I did, I thoroughly enjoyed it. As a young girl, Tess was kidnapped from outside her home. She was lucky enough to get away but cannot remember a thing about her ordeal. Now, as a grown woman, she has to return to her childhood home to sell it following the death of her mother, and finds that young girls are still going missing. Her childhood best friend, Gabe, is now sheriff and needs her help to find these girls if they are still a It took me a couple of chapters to get into this book but once I did, I thoroughly enjoyed it. As a young girl, Tess was kidnapped from outside her home. She was lucky enough to get away but cannot remember a thing about her ordeal. Now, as a grown woman, she has to return to her childhood home to sell it following the death of her mother, and finds that young girls are still going missing. Her childhood best friend, Gabe, is now sheriff and needs her help to find these girls if they are still alive. If only Tess could remember, she could provide the clues he needs. It is a very good crime read, in a very creepy small town America setting. There are plenty of suspects revealed throughout the book, which does twist and turn enough to keep you guessing. I have to admit I did guess who was responsible a little way before it was revealed in the book, but not for the reasons stated in the book – my mind was on a different track entirely! The story is very readable, moves at a good pace towards an exciting climax. Many thanks to the publishers for the advance review copy. I read this back in September of 2018 and wrote my thoughts down, but I never got back to publishing a review, so forgive me if this seems less than stellar months later. Teresa (Tess) inherits her family home and hopes to sell it. Abducted as a child, Tess has very few memories of the event. When another girl is taken, Tess wants to remember in order to help that family find their child. Sherriff McCabe was in charge of several children the day Tess was taken. Only a child himself at the time, hi I read this back in September of 2018 and wrote my thoughts down, but I never got back to publishing a review, so forgive me if this seems less than stellar months later. Sherriff McCabe was in charge of several children the day Tess was taken. Only a child himself at the time, his guilt has stayed with him all these years. Those feelings may be the reason he went into law enforcement like his father. Can Tess and McCabe solve this current missing person case and heal their wounds from the past? I enjoyed the mystery portion of the novel the most. I didn’t guess who the villain was until at least the last quarter of the novel. Even then, there were so many possible suspects that I wasn’t sure of my guess while the evidence started to stack up. My issues with this book were the missing words and the dialogue seemed choppy. This is a 2014 publication, so I’m sure the author has grown with experience, or maybe her style just didn’t work for me. The emotion seemed to be missing where I felt it should be stronger. I got bogged down by the overabundance of nonsensical internal dialogue for the main characters. I’m not a fan of internal dialogue, so that will always bother me if there is too much of it. Again – the mystery was good. I loved the clues and how they spoke to the insanity of the villain. The town was interesting but there was something flat about the characters. As a witness to this couple falling in love, I didn’t feel their emotion. There was something missing in the characterization, or the storytelling that made me start skipping paragraphs halfway through the book to finish. I don’t feel I missed much, because when I did read a page thoroughly, I wasn’t connecting more with the characters. I have several of Karen Harper’s books in my TBR, so I will try more to see if it was this book or her style that I didn’t relate to, or maybe my book mood that just wasn’t having it. I think my reading enjoyment often depends on whether I’ve been so blown away by another book that it makes it hard to concentrate on a new-to-me author. Sometimes a prior book stupor causes nothing but trouble for the next couple books you try to read. But in the end, it’s the success of the mystery – it held me captivated enough to want to finish the book when the characters seemed one-dimensional. I hate being left out when others seem to really enjoy a story – but we readers are as varied as the authors telling their stories. Review by Dorine. Book purchased or received for free in publisher promotion with no expectation of review. Shattered Secrets is the first romantic suspense I've read in awhile. The plot sounded great and the reviews were promising. I had high hopes for it. Unfortunately, I did not think it lived up to the hype. I felt that the story was rushed and poorly written. I never felt invested in the characters or the town. I also found the dialogue stilted. Basically, there was no flow to this book. There were parts of the story that had no bearing on the story line whatsoever and others that didn't get full Shattered Secrets is the first romantic suspense I've read in awhile. The plot sounded great and the reviews were promising. I had high hopes for it. Unfortunately, I did not think it lived up to the hype. I felt that the story was rushed and poorly written. I never felt invested in the characters or the town. I also found the dialogue stilted. Basically, there was no flow to this book. There were parts of the story that had no bearing on the story line whatsoever and others that didn't get fully explained. Maybe that happens in the next two books of the series, but I won't be reading them. The climax when it came was frightening, shocking and goosebumps inducing. Although I had an inkling to the real kidnapper but still I was left too scared and way too thankful of the fact that I wasn't really present in Cold Creek! A special thank you to Harlequin MIRA and NetGalley for an ARC in exchange for an honest review. SHATTERED SECRETS by Karen Harper, a Cold Creek Series (Book 1) romantic suspense crime trilogy about three different sisters, three desirable and dangerous men, and three endangered lives. The Cold Creek Trilogy begins with SHATTERED SECRETS (Tess’ story)-Sept, FORBIDDEN GROUND (Kate’s Story-heroine)-Nov, BROKEN BONDS (Charlene’s story)-Jan; set in a small rural town in the Appalachian area, holding A special thank you to Harlequin MIRA and NetGalley for an ARC in exchange for an honest review. The Cold Creek Trilogy begins with SHATTERED SECRETS (Tess’ story)-Sept, FORBIDDEN GROUND (Kate’s Story-heroine)-Nov, BROKEN BONDS (Charlene’s story)-Jan; set in a small rural town in the Appalachian area, holding dark secrets (when the sisters return for a wedding, they become involved in crime and love). Returning to the rural area of Cold Creek, Ohio, is an act of courage for Tess Lockwood (former Teresa). Abducted and held captive as a young girl and was held for eight months, she is unable to remember anything about the crime that destroyed her childhood and tore her family apart. Now she is back, to settle her mom’s house she inherited and her goal is to sell it as quickly as possible, in order to purchase the Sunshine and Smiles Center for preschool kids in Jackson, Michigan where she has worked for years. She plans to live upstairs and redo the space downstairs, where she would teach and protect the young children. She is not sure how people in this town would react to her as eighteen years have passed since she has been back. She is haunted by the cornfield, where she had run to hide when Gabe their teenage next door neighbor and the Sheriff’s son had told her to cut it out and called her a crazy tomboy. However this cornfield may prove to be a sanctuary instead of the site she feared all these year, and Gabe may be more than a friend. Gabe is back as well after Iraq, and has taken over his parent’s house, the current county sheriff and hopes to shed new light on the cold case, especially given his growing feeling for Tess. Tess isn’t ready to recall what happened to her, but when another child in the town goes missing, she’s certain it’s related to her abduction. Together, Tess and Gabe work to unlock their painful memories to save a child and heal their damaged souls. A story of crime against innocent children, an average woman’s life impacted by crime and tragedy, who finds the strength and courage to solve the crime with a little help from the hunky police. All add up to a suspenseful and engaging tale with a twist of contemporary romance. This was my first book by Harper and look forward to the other books in this gripping trilogy! Seems like everyone has a secret in this book, some red herrings and some just downright despicable. I've never been a fan of cornfields and for sure not after reading this book. Missing children is always a tough subject and happens way too often in the real world. Drug labs and dog fights also find their place in this book. 3. Seems like everyone has a secret in this book, some red herrings and some just downright despicable. I've never been a fan of cornfields and for sure not after reading this book. Missing children is always a tough subject and happens way too often in the real world. Drug labs and dog fights also find their place in this book. I liked some things about this book quite a lot but other things bugged me enough that I'm only giving it a 2-star "OK." I liked the characters and the main storyline of the kidnappings quite a bit but towards the end it felt like the author threw in every possible stereotype to endanger the protagonist. A meth lab? Was that necessary? Also, I don't know how to explain it exactly, but there were numerous moments where she used a 10 dollar word when a $ word would do... in a way that I found jarr I liked some things about this book quite a lot but other things bugged me enough that I'm only giving it a 2-star "OK." I liked the characters and the main storyline of the kidnappings quite a bit but towards the end it felt like the author threw in every possible stereotype to endanger the protagonist. A meth lab? Was that necessary? I really wish we could give half stars, I would give this one 3 1/2. I found this improbable number of disasters she found herself in a little tedious. She no sooner got rescued from one peril and then was right into another. Storyline was good. I figured out the who, but not the why and was a little disappointed when it all came to light, seemed a bit of a letdown. The first in a new romantic suspense series by well-known author Karen Harper. The first 1/3 of this book was quite interesting - it laid down the character of Tess and her backstory, setting up a nice little mystery story. I was hooked by that point. But then, it started to plummet downhill pretty quickly, I am afraid. The dialogue got to be ridiculous - if you knew people who spoke like that in real life you would be questioning their sanity. The actions of Tess and Gabe seemed to be well out of proportion to the situations they were in. And, speaking of situations, they got increasingly more absurd and the way Tess and Gabe got out of them became purely insane. I am still giving this 3 stars as I am hoping that future books will help the author clear through the silliness she put on those characters and tighten it up a little more and give the reader a real suspense novel. Although I did feel like this moved a little slow, I did enjoy listening to Shattered Secrets and will continue on with the series at some point! This had good, strong characters and a solid story. I like the fact that Tess doesn't give up and keeps going despite everything that is against her! I must say that in the end, the story was quite surprising and took a bit more of a different turn than I expected! Karen Harper really threw some stuff out there, which I appreciated! Overall, I enjoyed th Although I did feel like this moved a little slow, I did enjoy listening to Shattered Secrets and will continue on with the series at some point! Can't wait to read the next cold creek story. Liked the characters. New type of criminal. Teresa (Tess) Lockwood returns to her childhood home in the small town of Cold Creek, Ohio, to make arrangements for the sale of the family house she inherited. The only reason she has decided to return is because she needs the money to help buy a daycare in Michigan. She hasn't been back to Cold Creek in over eighteen years and prefers to leave the past forgotten. Sheriff Gabe McCord was the teenager in charge of watching the neighborhood kids on that fateful day when Tess was kidnapped. Tess returned home eight months later with virtually no memory of the event that occurred during that time frame. Sheriff Gabe McCord is in the process of investigating the disappearance of a small child, Amanda Bell when he is summoned to town to discover that another child from the small town of Cold Creek has gone missing. Tess is barely home for the weekend when a child is abducted and she finds herself involved in not only trying to help find a missing girl, but trying to unlock the memories from her past. As Tess offers her help, someone is intentionally trying to scare Tess away and make sure her memories stay buried. Sheriff McCord finds himself in role of protector to Tess as they work together to try and solve the crimes. As Tess and Gabe explore the list of questionable suspects, including the leader from a religious cult, as well as old and new suspects, I found myself constantly guessing who the villain could be and why all the way up until the author divulges the information to the reader. The romance between Tess and Gabe is subtle. There is no insta-love or insta-lust in this story. There is a small dosage of romance in this story, but the author seems to downplay this aspect and focus primarily on the mystery and suspense aspects. I thought this story was well-written and enjoyable. I don't think I'll ever look at cornstalks and scarecrows in the same light after reading this story. I would definitely read more of this author's work. If you like a page turning suspense, I would recommend this book. A copy of Shattered Secrets was provided via NetGalley for an honest review. Tess Lockwood has begrudgingly returned to Cold Creek, Ohio to sell the family home. She (and her family) left town after six-year-old Tess was kidnapped and held captive for eight months before suddenly reappearing. Although 18 years has passed since her abduction Tess remembers nothing about those eight months but still suffers from nightmares as a result. Her plans to keep a low profile are thwarted when a four year old girl disappears just after Tess’s arrival. She’s the third girl to be tak Tess Lockwood has begrudgingly returned to Cold Creek, Ohio to sell the family home. She (and her family) left town after six-year-old Tess was kidnapped and held captive for eight months before suddenly reappearing. Her plans to keep a low profile are thwarted when a four year old girl disappears just after Tess’s arrival. She’s the third girl to be taken and only Tess returned to her family. Tess joins forces with the local Sheriff in an attempt to jog her memory about her kidnapping and find the latest victim - before it’s too late. Novels like Shattered Secrets are a guilty pleasure for me. When I first started the book I made notes about the writing (bit awkward in places, could have used a good edit etc) and the fact that it wasn’t going to win any literary prizes. I realized however, that I was being incredibly harsh on a writer with so many books under her belt and who – I’m sure – is loved by many. It occurred to me that there are some authors who are masters of the written word and then there are some who can spin a great tale. (indeed I recently wrote about Paulo Coelho’s Adultery – beautifully written but #meh). I hadn't read any of Karen Harper's previous work but she's reminiscent of Nora Roberts - offering good balance of mystery and romance. I ended up reading Shattered Secrets in a sitting. I struggled in parts, but the main characters were engaging and likeable. And ultimately I kept reading because I HAD TO KNOW WHAT HAPPENED! I understand this is the first in a new series and I look forward to what comes next! when I first started reading this book I wasn't too sure about how well I would like it and I was very happy when I got to page twelve it was like I didn't want to put the book down because I had to know what happened, who took tess and the other two girls. When I got to the chapter that told me Dane was the number one suspect in the investigation from twenty years ago I kinda went along with it considering he had easy access to the cornfield where she was taken from and the drugs that were used to sedate her during her time in captivity due to him be a vet and having anesthesia type medicines. Tess Lockwood is the girl it all started with she was taken from her cornfield one day in october when her neighbor, Gabe McCord only thirteen at the time, was watching her and a few other neighborhood kids. When she wasn't listening he yelled at her to get out of the cornfield and she ran farther into the rows of corn and that is when she was taken. Twenty years later Tess has returned home to sell her mother's house and that's all she wanted to do was sell the house and leave. Two more girls had been kidnapped and tess felt trapped, the house wasn't selling and she was being questioned by quite a few people about her abduction which she can't remember she doesn't know why she can't remember until the new sheriff Gabe McCord tells her about the needle punctures on her arm, that detail was never released and she was never told about that either. Gabe and Tess struggle to find the kidnapper and the two girls that had recently been taken. Pretty good. This is the first Karen Harper book I have read and won't be the last. I like her style of writing and her story building. This is book one in the "Cold Creek" trilogy and this follows a woman who comes back home to sell her Mother's home after her death. When she returns she not only has to wrestle the hassle of selling off her family home but dealing with the few memories she does have of when she was kidnapped for 8 months from the cornfield behind her home. When more girls go mi Pretty good. This is the first Karen Harper book I have read and won't be the last. I like her style of writing and her story building. This is book one in the "Cold Creek" trilogy and this follows a woman who comes back home to sell her Mother's home after her death. When she returns she not only has to wrestle the hassle of selling off her family home but dealing with the few memories she does have of when she was kidnapped for 8 months from the cornfield behind her home. When more girls go missing she starts to try and help find them by trying to recall the horrible events that she had subconsciously buried. I did like how it was hard to guess who the kidnapper was but once it was revealed it it didn't much make sense why it was that person. It almost seemed like the efforts in diverting our suspicion off that person and on to others was almost a little too much - however I didn't have it figured out till the very end. No real shocker, but I did like the slight twist. There were some things that were left open but I am willing to bet since this is book 1 the other things will be resolved in the other books. I truly enjoyed this novel it was a great Romantic/Suspense story. It's about a young woman, Tess who is returning to her hometown to sell her family home that she hadn't been to in many years. Her family left town when she was very young because of terrible thing that happened to Tess. She is still remembered as the young girl who suffered a terrible trauma. She meets the new Sheriff who is the son of the Sheriff that was on her case. She finds herself involved in a several cases that resemble I truly enjoyed this novel it was a great Romantic/Suspense story. It's about a young woman, Tess who is returning to her hometown to sell her family home that she hadn't been to in many years. Her family left town when she was very young because of terrible thing that happened to Tess. She is still remembered as the young girl who suffered a terrible trauma. She meets the new Sheriff who is the son of the Sheriff that was on her case. She finds herself involved in a several cases that resemble her own and the Sheriff goes to her for help. This is the first of a trilogy and I'm really looking forward to reading the others. Good start to this series. I enjoyed the suspense with the main characters and the bumbling attempts to work out who dun it. I was initially unsure if a relationship between Gabe and Tess was a good idea - in fact a little creepy given that the last time they had seen each other was when he was 12 and she 4 or 5, but I got over that. I didnt love Tess - I thought she was a shallow and a bit dumb to be honest, but she found her spine by the end. The story had so much promise and suspense to start off with, but the poor pacing and lack of character depth was it's downfall. I found some of the "dangerous" events in the book unnecessary to the development of the plot and was just thrown in to add some excitement to the story. The entire thing then wrapped up overly quick with very little realism. Overall it was a bit disappointing. I will not be reading the other sequels. Exciting and suspenseful with a little romance thrown in. The plot follows a logical course and the characters are well-developed. Unfortunately, I deduct points when I find things that, while they sound good, are wrong. In this novel, it had to do with the tracking dogs. Otherwise, this was an enjoyable read. The book was an okay read as a woman returns to the small town she grew up in 10 years after being kidnapped as a child in a cornfield when the house is left to her in her mother's will. Suffering from nerves, flashbacks and terror, she wants to leave as soon as possible. Until she meets the new sheriff, Gabe McCord, the very same older boy who was supposed to be watching over several children when she was kidnapped. She wants to hate him, but is, instead, drawn to him. And over the years that s The book was an okay read as a woman returns to the small town she grew up in 10 years after being kidnapped as a child in a cornfield when the house is left to her in her mother's will. Suffering from nerves, flashbacks and terror, she wants to leave as soon as possible. Until she meets the new sheriff, Gabe McCord, the very same older boy who was supposed to be watching over several children when she was kidnapped. She wants to hate him, but is, instead, drawn to him. And over the years that she has been away, several children had disappeared in similar circumstances to hers, including one when she was there and she desperately wants to help--if only she had any memory of what happened to her, or who took her during the 4 months she was gone. First I am dumbfounded that Mira Harlequin published this book with both content and editing errors in the text. Why do publishers even hire editors that just spell check. Second I tried to listen to the book and the narrator made the Sheriff the hero in the book sound like a halfwitted buffoon. It was like listening to a redneck caricature of a good ole boy sheriff. Third I was bored to tears by this book, as the premise sounded great but the execution was horrid. So many false leads and read herrings it try to throw a reader off, all failed miserably. Fourth the characters have no depth at all. I finished the book, but it truly was a waste of time.